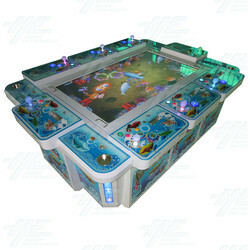 Seafood Paradise 2 58 inch Arcade Machine with Note Acceptor and Thermal Printer is a video redemption, fish hunter arcade game cabinet with an oceanic theme. Based on the marine fishing theme, it is a lottery-type game which includes 19 different types of fish. In the game there are three kinds of powerful special weapons! The aim of the game is to catch as many fish as possible for the msot points, and players can earn high-score rewards for all their hard work! The main difference between this version machine and it's predecessor is that Seafood Paradise 2 has removed the Spongebob character bomb, has replced one of the special with a new Power-Up weapon, and had loads of more awesome features, like exciting new fish types! Special weapons include: -Power- Up Energy Cannon - Fires for 30 seconds free of charge -Circular Power Grid — Last in the fields in a sustained 5 seconds -Invincible Cannonball — Kills all fish in the field at once The cabinet features a 58 inch LCD monitor with high definition graphics, the use of full-color high-definition scene dynamic production, note acceptor and thermal printer for input/output options, and support online games. It also features a colourful and attractive cabinet design, brightly lit with LED lighting and catchy game music to keep players entertained. Seafood Paradise 2 58 inch Arcade Machine with Note Acceptor and Thermal Printer is a video redemption, fish hunter arcade game cabinet with an oceanic theme. The main difference between this version machine and it's predecessor is that Seafood Paradise 2 has removed the Spongebob character bomb, has replced one of the special with a new Power-Up weapon, and had loads of more awesome features, like exciting new fish types! The cabinet features a 58 inch LCD monitor with high definition graphics, the use of full-color high-definition scene dynamic production, note acceptor and thermal printer for input/output options, and support online games. It also features a colourful and attractive cabinet design, brightly lit with LED lighting and catchy game music to keep players entertained. Key In/Out function, and Note Acceptor and Thermal Printer input/output options.